I’m proud to say that I got my greedy paws on this book before it hit the shelves! This is the first time I ever tracked down the author to ask beg for an advance copy. You see, his most recent book Head Full of Ghosts was the scariest thing I’ve ever read. That’s saying a lot because I devour all things horror. Sorry, Stephen King, but this book even trumps The Shining and Salem’s Lot. I never thought there would come a day when I would say such a blasphemous thing! So you get the picture, right? I’m a Paul Tremblay fan girl. I’ll get to Disappearance at Devil’s Rock in a moment, but let me just give you some backgrounder on Head Full of Ghosts. That book scared the I-don’t-know-what out of me! It’s like the author knows that I’m a jaded horror movie/book junkie. He knew just how to hit that sweet spot—that part of me that is scared to pieces of the unknown, the uncanny, the dark forces that drift between this world and the great beyond. There is nothing more unsettling than the thought of living under the same roof with someone who may or may not be possessed by demonic forces. However, I did have some doubts about my sister from time to time. Kidding! Well…sort of. Head Full of Ghosts got under my skin because it seemed so real. I could totally relate to the dysfunctional, blue-collar household because I lived in one. I could especially connect wit the two bickering sisters. I remember scaring my poor sister silly with my “demon voice” at night when we were forced to share the same room. To be honest, I even scared myself! Could you imagine the horror of hearing that voice, knowing that your sister really could be possessed by the devil? Jeepers!! I’m giving myself the willies just thinking about that book…and how it all came to a head in the end. Don’t worry! I won’t tell you what happens, but I will say that it’s the scariest—and most satisfying—ending. 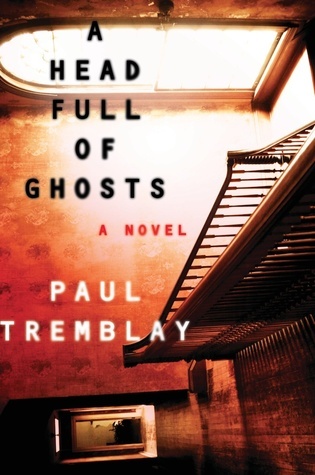 The genius of Tremblay’s storytelling is that he doesn’t spell it out for you. It’s up to the reader to pick up on the subtle clues and draw their own conclusion at the end. Like Mulder, I want to believe. Judging by the little hints—and one big nudge at the end—I got exactly what I wanted. Now let’s get to Devil’s Rock, shall we? This book follows on the heels of THE SCARIEST BOOK EVER so I lowered the bar just a tad. That proved to be unnecessary. Though it’s an entirely different story, the same dark undercurrents course through the chapters, drawing questions about the possibility of demonic possession vs. mental illness. I have my own theory about what happened when Tommy met his fate at Devil’s Rock. I’m sure the Scullys of the world will draw their own rational conclusions. However, thanks to the final teaser in the very last chapter, I’m willing to bet my entire collection of Stephen King books that evil forces were at work. It’s really hard to review this book without revealing any spoilers, but I will say that it is an addictive read that’s riddled with elements of the uncanny. I’ve always been creeped out by the idea of the doppelgänger. How creepy would it be to see an exact replica of yourself running around at night? Tremblay took this concept to a very dark place and I’m getting the pricklies just thinking about it! Oh how I wish I could tell you more about the sequence of events, which are gradually unveiled through the pages of Tommy’s journal. What really happened the night he disappeared? Why does it seem that his friends are all hiding a deep-dark secret? Who or what is lurking outside in the shadows and leaving pages of Tommy’s diary on the living room floor? You’ll have to read the book to find out! I’ll stop right here before I give anything away. Just please read this book and share your thoughts with me. I would love to compare theories! I’m still pondering the meaning behind the phrase, “The Devil’s in the Coincidence,” and whether or not life is just one big connect-the-dots puzzle. In the meantime, I’m going to pick up a light and fluffy cozy mystery to balance things out a bit. Then I’ll embark on a book that reviewers have been comparing to Tremblay’s work: House of Leaves. 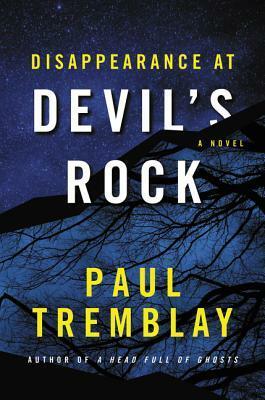 Posted on June 12, 2016 by Bubble Bubble Books and Trouble •	This entry was posted in Adult Fiction and tagged demonic posession, Disappearance at Devil's Rock, ghost stories, Head Full of Ghosts, horror stories, Paul Tremblay. Bookmark the permalink. Well I’ll have to add both books to my wishlist now! I love horror, but am constantly disappointed by the predictability and poor endings of a lot of them. This author sounds just the ticket…Thanks! Please read both of these books! If you like drawing your own conclusions, you’ll have a lot of fun!